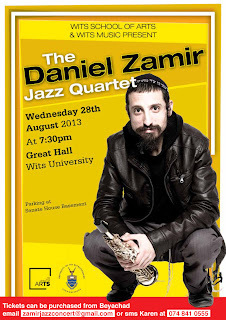 In the audio recordings, the organisers of the upcoming Daniel Zamir (John Zorn's Tzadik label artist) at Wits University in Johannesburg (scheduled to take place on Wednesday the 28th of August), admit that they make use of "background checks" and are trying to keep the event as a "Jewish only" event - even though the event has been advertised as being open to the general public. The hosting of Israel's Daniel Zamir at Wits University comes five months after another Israeli musical event at Wits University was protested and subsequently cancelled. Wits University Student: "This is a Jewish only event?" Organiser of Daniel Zamir Israel concert: "Yes, it is"